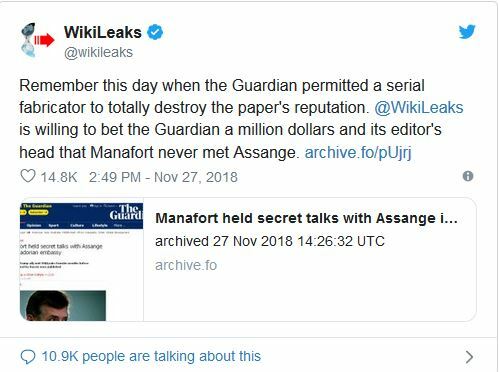 Luke Harding and Dan Collyns, writing in the Guardian, have claimed Paul Manafort (jailed former-campaign chief to Donald Trump) met with Julian Assange, the illegally detained founding editor of WikiLeaks, in the run-up to 2016 Presidential election. You can read an archived version of their article here, just in case The Guardian “amends” their claims in the future (Update – The Guardian has already edited their article to scale back their language. Called it). Other “news” outlets have, rather predictably, jumped all over it. Faced with the backlash, the Guardian quickly – and very quietly – rowed back its initial certainty that its story was based on verified facts. Instead, it amended the text, without acknowledging it had done so, to attribute the claims to unnamed, and uncheckable, “sources” ….